Lately, I see more and more articles saying that people should reduce the time they are spending on gadgets or describing the benefits of disconnecting from tech. These articles contain a reasonable grain since permanent use of gadgets can really adversely affect the human psyche. The American Psychological Association (APA) officially confirms that those who often check mail or incoming messages in social networks are more prone to stress. Despite the fact that the texts I mentioned above are right in many ways, I want to look at the problem from a slightly different angle. The thing is that not every person is able to minimize the time he or she spends on interaction with technology. Many people are doomed to experience stress since their work is directly related to tech. 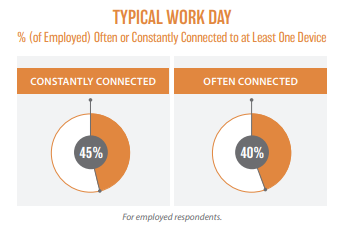 According to APA research, almost half of all workers are constantly connected to at least one device or gadget. Of course, you can decrease using a mobile phone at home, you can refuse to go online at all in your free time, but what if your job involves the processing of large amounts of data? For example, if you work as a sales or marketing manager, one way or another, you will have to use a large amount of software in your work. HubSpot Sales, Unomy, Salesforce – the list of tools may seem endless. How can a person avoid stress in such circumstances? Change a job? In fact, everything is not so sad. Even if your job involves a permanent interaction with tech, you can still make your life easier without taking any radical steps. Here is what I can advise you from my work experience as a marketer. To begin with, you can reduce the burden on your psyche simply by starting to use fewer tools. If it seems to you that all the programs that you use in your work are irreplaceable since you never know which data may be useful, take a look at the statistics. According to Quantifind, almost 80 percent of gathered consumer data has no correlation to revenue. However, many marketers spend time and energy on constant gathering and accessing data. The survey by TMMData states that three in five data professionals say it takes days or weeks to access their data and 48% still question their data’s accuracy. To avoid unnecessary stress, try changing your approach to data collection. Determine the most important KPI in your work. Use only those tools that help to obtain data associated with this indicator. You will be able not only to save your organism from unnecessary stress but also make your work more efficient. If you can not minimize the amount of software used, try changing the software itself. Let’s imagine you work in the marketing department of a small or mid-size company. In this case, you don’t necessarily need advanced CRM solutions, such as Salesforce. Most likely, a more simple and understandable tool will be enough for your work. Similarly, you do not have to immediately choose the most complex of the solutions while choosing a platform in order to build your website on. For instance, you shouldn’t use such sophisticated tools as Drupal when the functionality of WordPress is enough for your needs. Perhaps due to its simplicity, the list of websites using WordPress is significant and this content management system is the most popular CMS at the moment. I think you understand the main idea – simplify what you can simplify. Approach technology wisely, and even if you won’t completely get rid of stress, you will definitely feel better.